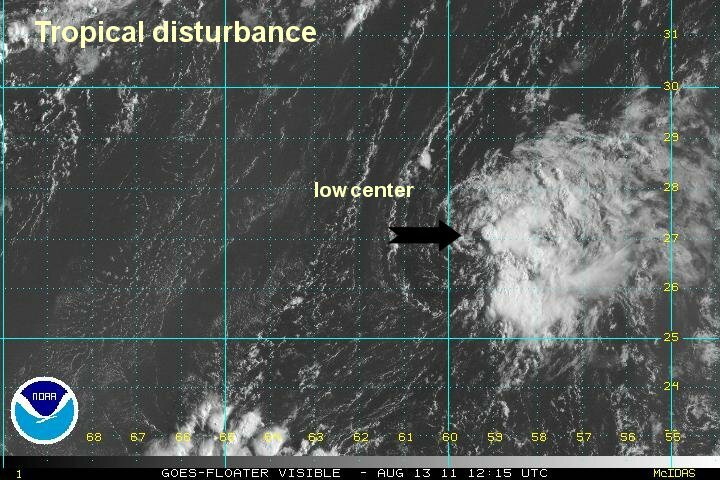 A low level circulation is now apparent with this disturbance as well as some deep convection near the center of circulation. 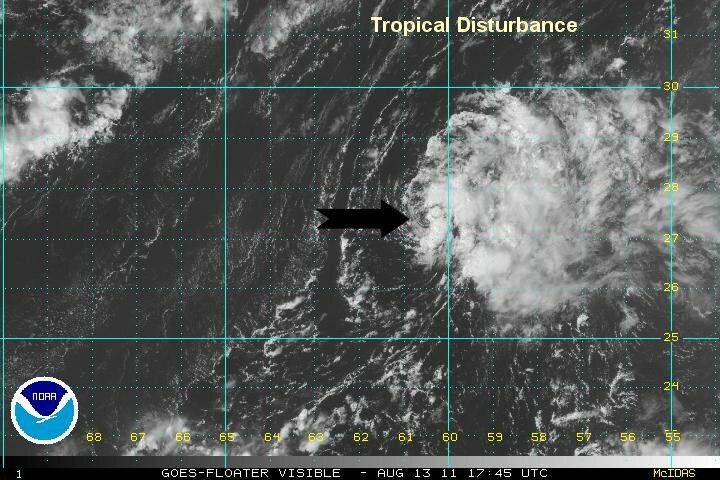 Because of this we believe that this tropical disturbance has become the next tropical depression. Deep convection is also noted on the eastern side of the circulation. As of 9 am edt / ast Franklin was centered 27.1 N / 59.5 W or roughly 500 miles se of Bermuda. It is moving nw at about 15 mph. Winds estimated at 25 mph. Pressure estimated at 1012 mb. Forecasts take this low northwest and recurve it to the east of Bermuda. 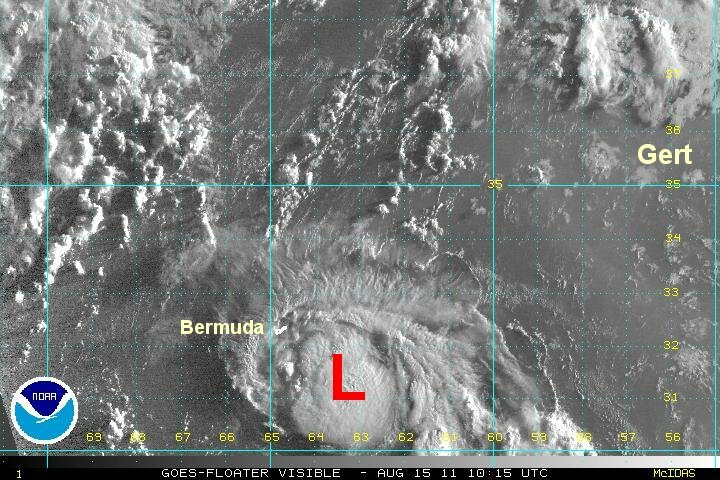 Because forecast models usually don't handle weak lows well, interests in Bermuda should follow the progress of the low. 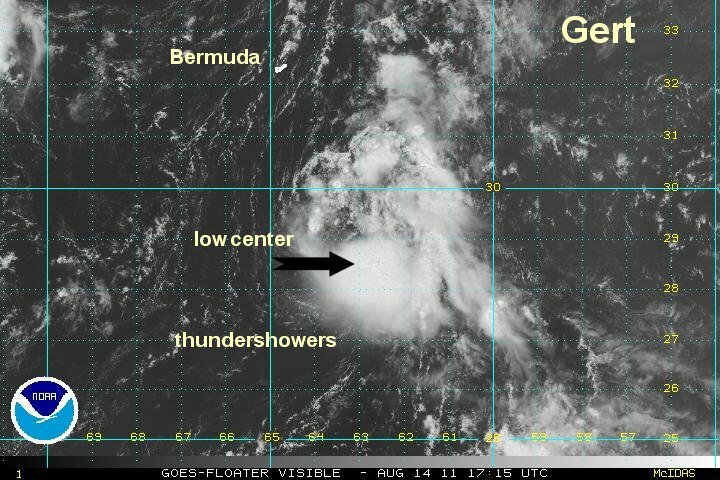 The disturbance southeast of Bermuda has pulsed today. This morning there was enough convection and a well defined low level circulation to be classified. Shortly thereafter, wind shear stripped the convection away. Now as of mid afternoon, deep convection is rapidly developing over the circulation center. As of 3 pm edt / ast unofficial td 7 was centered 27.5 N / 60.7 W or roughly 410 miles se of Bermuda. It is moving wnw at about 12 mph. Winds estimated at 30 mph. Pressure estimated at 1010 mb. Forecasts take this low northwest and recurve it a little to the east of Bermuda. Because forecast models usually don't handle weak lows well, interests in Bermuda should follow the progress of the low. 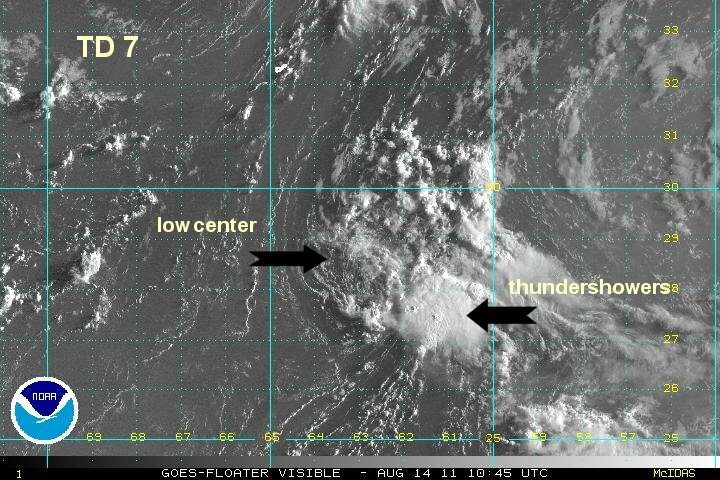 TD 7 was officially classified lat night, but in our estimation has changed little. Wind shear pulsed up again last night and has stripped the convection from the center of circulation. Some heavy storms remain southeast of the center. The main effects for Bermuda will likely come after the low has passed if the current configuration of unsettled weather continues. TD 7 will not be a major concern for Bermuda or for its visitors. As of 8 am edt / ast td 7 was centered near 28.1 N / 62.9 W or roughly 300 miles sse of Bermuda. It is moving wnw at about 10 mph. Winds estimated at 30 mph (NHC 35 mph). Pressure estimated at 1010 mb. Forecasts take this tropical cyclone close or just east of Bermuda early tomorrow morning. 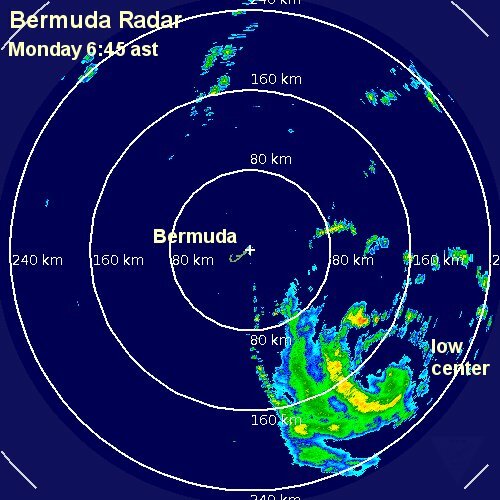 Showers will reach Bermuda by later today. TD 7 will likely still be a tropical depression or minimal tropical storm as it passes Bermuda. The main effects will be a period of showers or storms from later today into Monday. Deep convection has built over the center of circulation as upper air winds relaxed this afternoon. With the increase in convection, the hurricane center has upgraded to tropical storm Gert. I don't feel that it is quite there yet but may reach tropical storm strength by this evening if convection continues to intensify. As of 2 pm edt / ast Gert was centered near 28.6 N / 63.1 W or roughly 275 miles sse of Bermuda. It is moving nnw at about 7 mph. Winds estimated at 35 mph (NHC 40 mph). Pressure estimated at 1009 mb. Forecasts take this tropical cyclone close or just east of Bermuda early tomorrow morning. 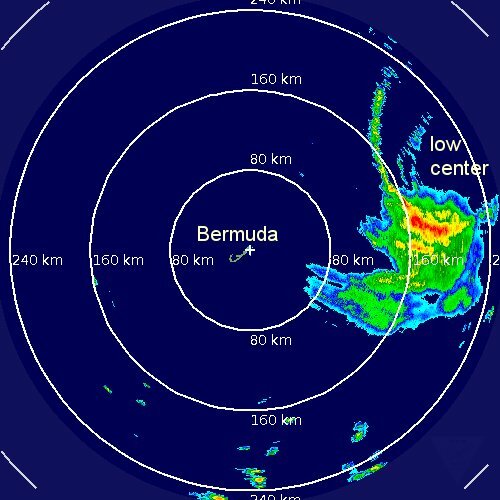 Showers will reach Bermuda by later today. Gert will pass Bermuda as a minimal tropical storm with winds likely about 45-50 mph. The main effects will be a period of showers or storms from later today into Monday. Gert has intensified a little more then anticipated with top winds estimated at 55 mph (NHC estimates 60 mph). It is far enough to the east that only light breezes will be seen on Bermuda. The heaviest rain will also be to the east with only scattered showers affecting the islands. All in all, Bermuda will experience only minimal effects. Gert is starting to pick up speed and will be to the northeast of Bermuda by later this afternoon. As of 8 am edt / ast Gert was centered near 31.5 N / 63.3 W or roughly 100 miles ese of Bermuda. It is moving north at about 14 mph. Winds estimated at 55 mph (NHC 60 mph). Pressure estimated at 1000 mb. Forecasts take Gert to the east of Bermuda by about 75 miles then into the open north Atlantic. Bermuda essentially saw no effects from Gert. Only higher than normal swell on the southeast coast. No rain was reported and the strongest wind was 16 mph. This was another case of overforecasting as a tropical storm warning had been posted. A Hurricane Hunter recon found a pressure of 1005 mph which suggests that the sustained surface wind is nowhere near 60 mph. The aircraft found a flight level gust to 70 mph but estimated surface winds of 40 mph. 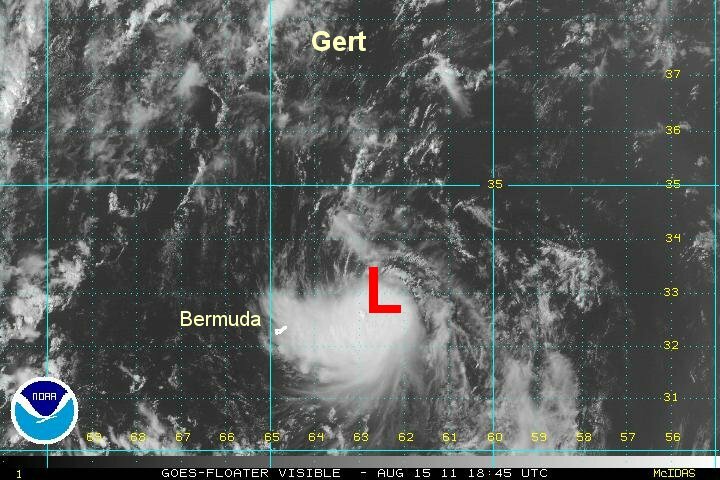 As of 4 pm edt / ast Gert was centered near 32.9 N / 62.7 W or roughly 120 miles ne of Bermuda. It is moving nne at about 14 mph. Winds estimated at 45 mph (NHC 60 mph). Pressure estimated at 1005 mb. Forecasts take Gert away from Bermuda into the northern north Atlantic and should become extratropical over the next few days.